The oceanfront view from Surf and Sand OceanFront Beach Rental is as good as it gets! Watch a gorgeous sunrise from the panoramic oceanfront deck while you sip your morning coffee. Listen to the roar of the ocean and crash of the waves while you enjoy an early evening cocktail! 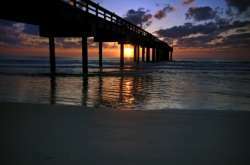 The St. John's County pier is walking distance from Surf and Sand OceanFront Beach Rental. 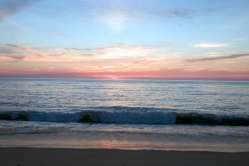 It is a 4 acre beachfront park with a variety of amenities including a playground, picnic table, restroom facilities, outdoor showers, covered pavilion, bait, ice, tackle, refreshments and lighted beach volleyball courts. It is open daily from 6:00 AM-10:00 PM. St. Augustine Beach is very wide, has gorgeous white sand, numerous local restaurants/amenities and is the most convenient to all the St. Augustine attractions. It is the most sought after beach in all of North Florida. Crescent Beach has a wide and sandy beach but is one of the furthest beaches from downtown St. Augustine and fairly isolated with few local amenities.